Last season, Canton-Galva finished 4-5, while Solomon was 5-4. This season, both teams are 10-1 and have emerged as the final teams in a relatively wide-open east side of the bracket. Solomon was a top-five team in the preseason and was expected to have a significant increase with multiple returning starters after hampered by major injuries last year. Canton-Galva, 2-7 just two seasons ago, has been one of Kansas’ top surprises with no seniors. Canton-Galva defeated Solomon in Week 7, 38-20, for the Gorillas’ only loss of the year. In the playoffs, Canton-Galva defeated Burlingame, 74-26, and then pulled off an overtime thriller, 54-52, at Coldwater-South Central, the prohibitive east favorite. South Central had entered the game with just 72 points allowed in 2018. Solomon earned a 52-6 win versus a high-octane, yet depleted Maranatha Academy squad, then won at Madison, 30-26, and at Argonia-Attica, 14-6, in a turnover-filled contest. For Canton-Galva, coach Shelby Hoppes has run the offense, while former Sharon Springs’ all-stater Tyler O’Connor has led the defense. In the first meeting against Solomon, O’Connor spent several weeks on a defensive game plan that especially confused the Gorillas on their zone read plays. Solomon finished with 133 rushing yards and 3.4 yards per carry. Junior Landon Everett has emerged as one of the state’s top dual threat quarterbacks. He has passed for 1,148 yards and rushed for 1,636 yards. Everett and freshman Tyson Struber have helped Canton-Galva intercept 27 passes, one of the best team marks in eight-man state annals. Sophomores Brandon Huff, Conner Koehn and junior Mason Reedy have been key on both sides of the ball. Struber has 693 receiving yards. For the season, Solomon senior quarterback Braden Neilson has completed 47 of 98 passes for 842 yards with a 15/5 TD/INT ratio. Senior Logan Krause has 122 carries for 1,085 yards and 24 scores. Neilson has 133 carries for 954 rushes for 20 TDs. Solomon is plus-18 in turnover margin, led by seven turnovers and two fumble recoveries for Neilson. Senior Eli Basvic has 110 tackles and 22 TFLs, while Jobe Fowles has 77 stops with 21 TFLs, and Krause has 68 tackles with 16.5 TFLs. Solomon has tied for the best finish in school history with semifinal showings in ’12 and ’15. Canton-Galva’s top finishes are second place showings in ’79 and ’91. Solomon, with veteran coach Steve Tiernan, will keep the game close. However, Canton-Galva has rolled offensively and should be able to outscore the Gorillas. St. Francis will make the 244-mile drive to Claflin in a game that has been moved to Saturday afternoon. The Oilers, ranked in the top-two all season, have enjoyed arguably the top eight-man defense in the last decade. Central Plains has outscored teams 534-28 for 2.5 points allowed a contest. The best eight-man defense in the last decade is 5.5 points permitted a game by Ness City in a 13-0 Division I state title year in 2012, according to Prep Power Index archives. Central Plains has no defensive starter more than 202 pounds but has significant athleticism and experience. Last week, Central Plains dominated a much larger Hoxie team, 54-6. It marked the first time Hoxie, the defending Division I state champion, had lost by the 45-point margin since a 50-0 defeat to St. Francis in Week 5 of the 2016 season. Those are the only 45-point losses for Hoxie since a 46-0 defeat to Hill City in Week 3 of 2010. Hoxie opened the game with a 6-0 lead and then Central Plains scored 54 straight points. Senior quarterback Myles Menges has completed 69 of 96 passes for 1,101 yards with a 22/3 TD/INT ratio, though did get banged up against Hoxie. Junior Lawson Oeser, a key role player as a freshman and oft-injured as a sophomore, leads the team with 73 carries for 651 yards and 16 scores. He had a huge game against Hoxie with 22 carries for 267 yards and five scores. Senior Alex Hickel has 66 carries for 635 yards and 13 TDs. Five players, led by 332 yards from junior Jerred Bieberle, have at least 165 receiving yards. The top-three tacklers are the Oilers’ standout senior defensive line with Grant Heldstab, Mason Doll and Brett Liebl. Heldstab has 123 tackles, 16 for loss. Doll has 100 stops, 15 TFLs, and Liebl has 86 tackles with 17.5 sacks, best in eight-man football. Central Plains has forced 27 turnovers, including seven interceptions from Menges, and is plus-20 in turnover margin. Hoxie became the first team to score on Central Plains since Week 2. The Oilers forced five turnovers and Liebl blocked a punt in the contest. St. Francis, unranked in the preseason, has enjoyed a surprise fall with first-year coach Nick Fawcett. After the Indians finished last year with low numbers, Fawcett had more players come out, implemented the single wing, and senior running back Jordan Raby has rushed for more than 1,300 yards. Senior quarterback Brady Dinkel is a three-year starter, two seasons under center. St. Francis was the state runner-up two seasons ago for the best finish in school annals. This season, the Indians moved into the rankings with a 64-30 district win versus Hoxie in Week 5. The Indians have a brand-new offensive line that has helped with a 30-12 win versus Victoria two weeks ago, and 30-20 against Hodgeman County last Saturday. Senior Tiernan Poling had a key interception in the second half that helped secure the quarterfinal victory over Hodgeman County. Sophomore 230-pounder Colton Neitzel and sophomore 205-pounder Jesse Baxter have has helped anchor the line. Both had not played before this season. St. Francis has outscored teams, 506-110, and stands second in the classification in points allowed per game. Central Plains last made a sub-state game in 2014 when it won the state crown with a 13-0 record. The last three years, the Oilers fell to Spearville and the single wing in the second round of the playoffs. Great credit to Fawcett for a big improvement as the single wing – whether it’s Spearville or St. Francis – gives teams fits. However, Central Plains, helped by its depth and home field advantage, is the favorite. These two Twin Valley League rivals will meet in a rematch of one of this season’s top games. Hanover defeated Axtell 50-42 back in Week 6, and will have to travel to Axtell again for the rematch. In the first meeting, Axtell score on the final play of the second quarter to pull within 28-26 of Hanover at halftime. The Eagles then scored first out of the locker room on a 10-yard touchdown run by Quinn Buessing to take a 34-28 led. From that point on, Hanover would score the next 22 points to take a 50-34 lead before the Eagles would tack on a late touchdown to pull within one score. Hanover quarterback Daiken Stallbaumer rushed for four touchdowns int eh game, while Carter Bruna added two more scores on the ground. Axtell was led by Buessing who rushed for two scores and threw a pair of touchdown passes to Hunter Koch. Axtell’s ability to hang with Hanover vaulted the Eagles up from No. 5 to No. 2 in the rankings that week, and they’ve remained their ever since. In the five games since the Hanover loss, the Eagles have scored 342 points for an average of 68 yards per contest. Axtell has posted playoff wins over Mankato-Rock Hills (80-30) and Waverly (54-8). Buessing and Koch have had one of the storied seasons in Kansas history. Buessing, the junior quarterback, has completed 71 percent of his passes for 2,380 yards and 50 touchdowns with just two interceptions. Buessing has added 630 rushing yards and 12 more scores. Koch, on the other hand, has 66 receptions for 1,220 yards and a state record 33 touchdowns. For his career, the senior receiver has 169 receptions for 2,837 yards and 63 scores. Juniors J.J. Hart and Derek Buessing, and sophomore George Volle will be key in this matchup as the Wildcat defense keys on Koch. Meanwhile on the visiting sidelines, Hanover still hasn’t lost a game since the 2015 state championship against Spearville. The Wildcats have won 35 straight games – 36 counting a forfeit victory over Blue Valley Randolph earlier this season. Sine the earlier meeting with Axtell, the Wildcats have allowed 36 total points with three shutouts. One of those shutouts came last week against St. Paul, whose feature back Adam Albertini entered that contest with 2,150 rushing yards and 53 touchdowns. Hanover raced out to a 30-0 lead and won 46-0 as the game ended at halftime. Stallbaumer passed for 135 yards and four touchdowns, while also rushing for a score. The Wildcats will have a distinct size advantage up front with Jonah Weber (6-4, 250) and Gavin Pralle (6-3, 250). In the end, these may be the two best teams in the classification, but until another team is able to break through, Hanover remains the favorite to get back to Newton for the fifth consecutive year. Regardless of what occurs in the final two weeks this season, Dighton’s season will be long remembered. The Hornets have nine wins – and nine players. Last week, the Hornets achieved a mild home upset against Otis-Bison, 44-36. The Hornets’ game-winning touchdown came on a remarkable 24-yard catch from senior David Cramer. Video of Carmer’s grab has went viral. The play came on 4th-and-13 with 69 seconds left. Cramer and two Otis-Bison players jumped for the ball. The ball ricocheted off Otis-Bison, and Cramer, lying on the ground with a defender on top of him, caught the pass one-handed against the defender’s back. Both teams suffered losses in the season’s first three weeks to Division I powers. Dighton fell to Hodgeman County in Week 1 and St. Francis in Week 3 in competitive contests. Osborne lost at Hoxie in Week 2 as the Indians pulled away in the second half. Each team’s strength comes in its bevy of experienced, all-state players as Dighton makes the 157-mile trip northeast. Dighton had made the semifinals in 1995, the only time past the Round of 16 in school history before coach Ken Simon arrived. Simon led the Hornets to the quarterfinals in 2013 and a state runner-up finish two seasons ago. Osborne captured the state crown in ’13 and ’16 and has rolled since the 52-20 loss to Hoxie. The Bulldogs have won every game since by the 45-point margin, including a 54-8 victory last week versus South Barber. Osborne has outscored teams, 636-210, against the No. 3 strength of schedule in the classification. Dighton has a total margin of 496-192 versus the No. 13 SOS. Osborne is led by first-year coach Brandon Wise and while former head coach Cullen Riner is the Bulldogs’ assistant. Osborne has rushed for 334 yards a game and passed for 78 yards a contest. Senior Darnell Holloway has thrown for 815 yards with a 12/2 TD/INT ratio. He has rushed 114 times for 1,365 yards and 27 scores. Junior Darrien Holloway has 133 carries for 1,271 yards and 28 TDs. Freshman Mason Schurr has emerged as another big threat with 85 carries for 765 yards and 11 TDs. Senior Kade Miller has 53 offensive touches and 10 TDs and easily leads the team with 99 tackles. The Holloways and Miller have all started at least two seasons. In his career, Miller has 238 tackles, 18 TFLs and 16 interceptions. Osborne lists just 14 players on the roster. For Dighton, the Hoffman twins and Cramer have led the attack. Senior Blair Hoffman has completed 111 of 161 passes for 1,549 yards and a 37/2 TD/INT ratio. Senior Dalton Hoffman has 868 yards and 10 touchdowns, while Blair Hoffman has 847 yards and 11 scores. Cramer is one of eight-man’s top receivers with 58 catches for 915 yards and 20 TDs. Dighton has great size up front but virtually no depth. Dighton has averaged 7.3 yards per play, and Osborne has averaged 10.3. Dighton has pulled multiple upsets in the last several years under Simon, and the passing game and talent will give the Hornets a chance. Dighton has thrown on 34 percent of snaps, compared to 14 for the Bulldogs. However, Osborne has rarely lost in the playoffs at home. 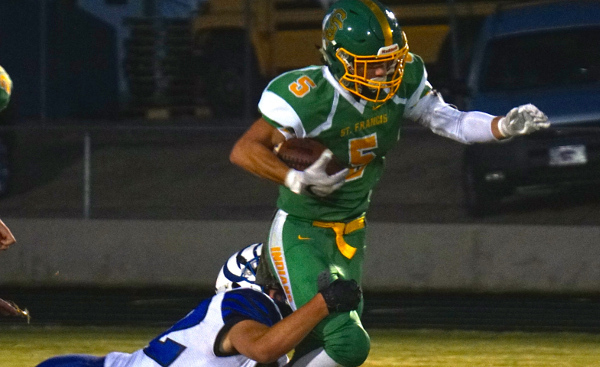 The Bulldogs, with Miller and Schurr as key secondary offensive players, have the advantage.